Scott Garner will be renewing acquaintances with some familiar faces at The Shay this season - but is happy to have them on his side for a change. The former Boston defender has had some memorable battles with North Ferriby in the Conference North, who were managed by his current boss Billy Heath and featured half-a-dozen of his new team-mates, who have followed Heath to Halifax. Garner said: “Any game I’ve played against North Ferriby under Billy has always been really fierce. I know what his teams are like and I know he gets results. “I played in midfield quite a lot for Boston so I had some clashes against Liam King and we gave each other a few kicks. “We’ve got some great pictures of us doing battle - we’re both passionate players and even though we were on opposing sides there was a mutual respect between us. “I’m certainly glad to have him on my side this season. “When I spoke to Billy the first thing I said was are we signing Tom Denton? “I didn’t relish playing against him and his elbows, although we can laugh about it now. “The players we’ve signed from North Ferriby are top-drawer, they’ve got the right mentality and they’re all winners. “Billy told me which players he was signing from there when I joined Halifax and I was really impressed. Garner was at Leicester from the age of 10 to 19, and played in a league-winning youth team that went on to compete in a Champions League-style tournament in Dallas. Garner played alongside Wales international Andy King as a youngster at Leicester and played against three Russian players who featured at Euro 2016 while captaining the England C side. Garner said he had a few offers from elsewhere, including one from a Conference Premier club, but believes Town can be a force to be reckoned with this year. 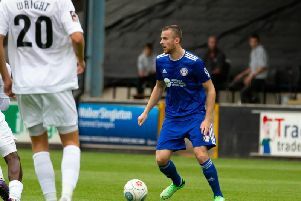 The defender is hoping it will be third time lucky after losing in the play-off semi-finals in the last two years, first to Chorley and then to Heath’s North Ferriby last season, despite winning the first-leg 2-0. “That is a scary scoreline because you don’t want to be too defensive but you naturally sit back a bit,” Garner reflected. “They got a dubious penalty after 10 minutes through Tom Denton and after that they were on the front foot and we were up against it. “The year before against Chorley we were winning until the last minute of added time and they scored with an overhead kick from the edge of the box. “I just couldn’t believe it - I turned round expecting to see it fly over the bar and it went in the top corner. “It was devastating because it was so late in the game - we were almost there. “Then it went to penalties and we hit the bar and there was some controversy whether it had crossed the line and we went on to lose. “Hopefully it’s third time lucky and hopefully this year I won’t need the play-offs and we can go up automatically.